That being said, he IS a Lab. 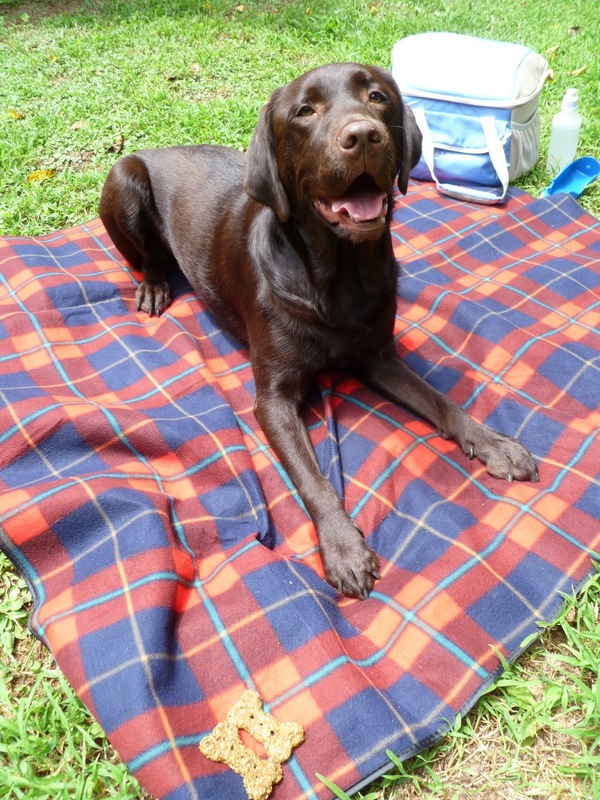 If you know one thing about Labs, it’s probably that they generally think about two things: food and how to get more food. In fancy dog training terms, this is called food-driven. This can be a blessing and a curse: a blessing when working on training, and a curse when trying to eat a meal with a food-driven dog in the room. I truly believe that with time, Porter could be taught to do our laundry if he knew there would be food in it for him. Unfortunately, this drive for any morsel of food is constant. When my husband Tim and I sit down to a meal (which, I’ll just admit now, usually consists of us sitting on the couch in front of the TV), Porter does an initial survey of our food, nose in full sniff mode, getting as close as he can to our plates, with us commanding over and over, “go lay down!”. We have found that this phrase is most effective when we say it with a happy and promising tone so as to convince him that he’s going to get something. When we say it just right, he will lie down on his bed and sit quietly and patiently, watching and waiting, just KNOWING that we’re probably going to throw him a whole pork chop. Even though this has never happened, you can just see the hope in his eyes. He is truly an optimist. Of course it must be torture for him to watch us eat. When you are as excited as he is for the same bowl of dry kibble every day, how good must a bowl of spaghetti or a steak smell? It’s surprising that he doesn’t hate us for making him wait the whole time we eat, only to be rewarded with a tiny scrap of something off of our plates once we’re done. But, I guess to him it’s worth it. This curiosity in food makes dinner parties difficult (most people don’t enjoy being stared down by a slobbering dog while enjoying their meal). Worse yet is trying to put out appetizers or snacks for grazing. Porter thinks that coffee tables were made for him - they’re right at snout level, so obviously everything on them is meant for him. Which is why we don’t have one. Knowing all of this, I’m not sure why I thought that taking him on a picnic would work. I guess that false hope sometimes gets in the way of common sense. 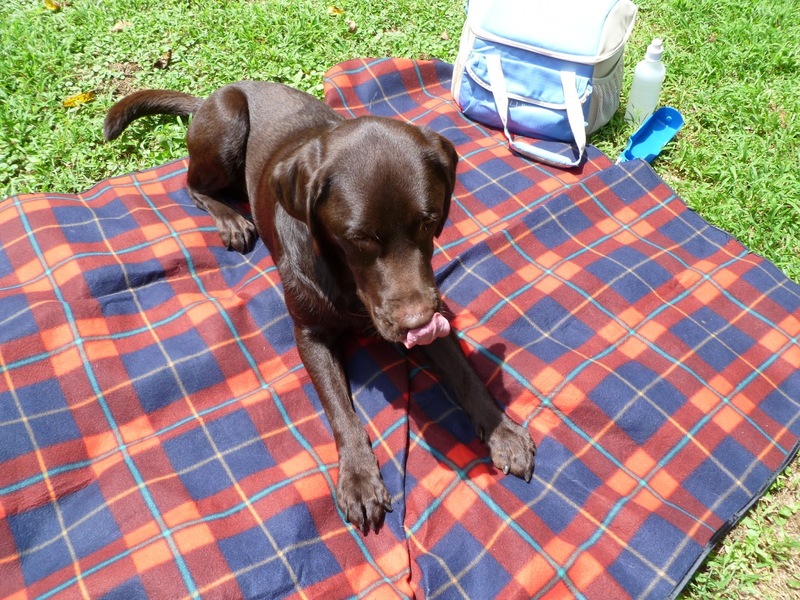 We decided to take advantage of a nice summer day by having a picnic, and I thought it would be a good idea to bring the dog along. My husband had other ideas, but my insistence that Porter would behave won out (or maybe my husband just gave up), and so we packed up our cooler and blanket and headed out. 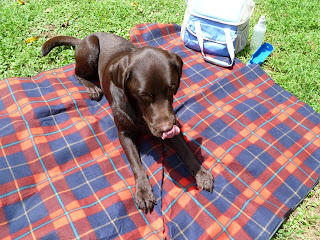 digging at the picnic blanket like he does his blankets at home. He got the middle of it gathered into a ball and then grabbed it in his mouth and tried to run away with it. (His strong food drive is clearly not his only behavior obstacle.) After getting the blanket straightened out, it was time to get out the food. Even with his favorite liver biscuits on hand (see recipe below), people food on the ground was just too tempting for him to handle. His head immediately dove into the cooler for inspection. The fried chicken got licked (thankfully it was in a plastic bag), drinks got knocked over, and plates got stepped on before they could even be filled. My husband and I basically had to take turns holding the dog so that we could eat our meals. When we were done eating and Porter did finally lay down, he did his best stealth dog belly crawl, inching ever so slowly toward our dirty napkins (another favorite treat of his - I guess he figures if you can’t get the food, you can at least get the food leavings soaked onto a piece of paper). I really can’t fault him for not being good. After all, food on the ground for him is pretty much a free for all. 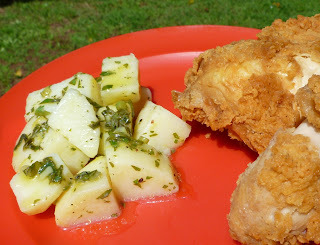 In the kitchen, anything dropped on the floor is fair game, assuming it’s not toxic or scalding hot, so when we set out our feast, he must have thought his day had FINALLY come and he was going to get his own plate, complete with fried chicken and lemon potato salad (recipe for lemon potato salad below). Sadly, we had to disappoint him. But, that night he dove right back into his same bowl of dry kibble, seemingly grateful just to have food to eat. And at our next meal, he went back to his patient, hopeful self, believing that one day he's going to get a plate all to himself. Even though Porter likes ALL the foods, he really went crazy for these. He even did a little "counter surfing" and stole one off of the cooling rack. 2 ounces low-fat cheddar cheese, shredded fine. Puree chicken livers in a food processor until liquid. Add egg and mix well. Gradually stir in the oat flour until a stiff dough forms (you may need a little less or more, depending on how finely your oats are ground). Stir in cheese. Refrigerate dough overnight. Roll out a portion of dough (it will be sticky) between 2 pieces of parchment paper, using extra oat flour (or wheat flour if you're not worried about food allergies) if needed. Use dog biscuit cookie cutter to cut out biscuits, and place them on a parchment-lined cookie sheet. Alternatively, you can just portion balls of dough onto a cookie sheet and flatten them with wet fingers or a glass bottom. Bake at 350°F for 25 minutes. The biscuits will be slightly soft in the middle. Store in the refrigerator. I had this at a co-worker's party once, and I loved it. Not only is it lighter for summertime, but you don't have to worry about mayonnaise baking in the hot sun! This made just enough for the two of us, with one serving left over. 3 medium potatoes, peeled if desired, and cut into bite-sized pieces. Place potatoes in medium saucepan and cover with water. Turn heat to high and when almost boiling, turn down heat to a simmer. Cook for 10 minutes, or until potatoes are tender. Drain. In a small bowl, whisk together lemon juice, lemon zest, olive oil, salt and pepper. Stir in green onions, parsley, and basil. While potatoes are still warm, pour dressing over them and mix well. Put into refrigerator to chill. Adjust seasoning before serving.